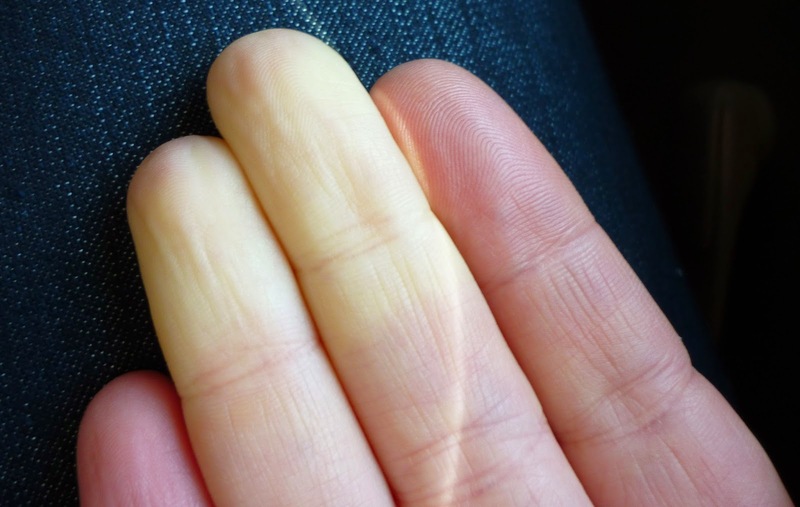 This, I am told, is Raynaud's phenomenon. All I know is it's bloody painful and my fingers can stay like that for ages if I don't warm them up again properly. And, once the blood starts coming back to my fingers, it burns like hell. Like, a hell with chilli sauce and extra wasabi. Since I am currently working at home (hooray, my old work sent me stuff to do for freelancing!) I get to spend my entire day in a very cold house. 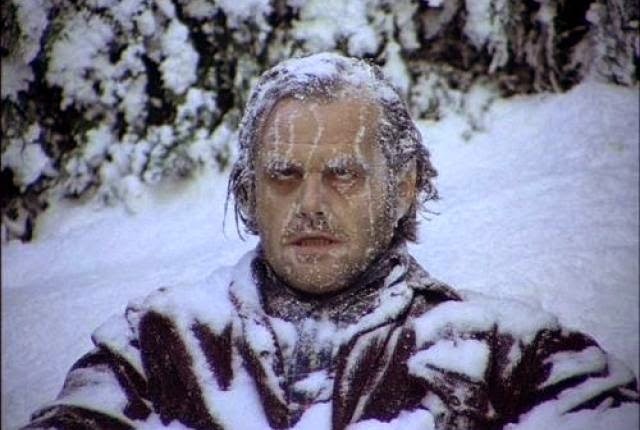 I've had to take to turning the heat up otherwise I find that at lunchtime I've got really cold. I've started having to have hot drinks instead of cold water just to try and warm myself up. Plus we have laminate floor so my feet are cold and I have to find myself a spare bit of rug or the table leg to lean my feet on! The problem with exercise is it's supposed to warm you up. Unfortunately I've discovered that you have to be warm to start off with, otherwise it's infinitely more painful. As doing exercise involves changing into more sporty-appropriate clothing (read Lycra, and no, I'm not going to wear it round the house all day to make sure it's warm), I end up putting cold clothes on to an already cold person. This appears to create a chain cold reaction where I'm cold to start off with, then make myself colder by changing and, just to top it all off, go outside to do the exercise. The average temperature over the last few weeks has been close to freezing. So I start running with frozen hands. Eventually, they will warm up, but - did I mention the burning pain when the blood returns to my fingertips? Cycling is almost worse. I can get away with more padding and fluffy clothes, so I can start off OK. However, I nearly came a cropper the other day by cycling up Cudham (it's a famous hill near here) whereupon it started to rain. This normally wouldn't be a problem, but the combination of cold and rain meant, when I stopped at the top and started to cycle back down again, I almost froze to death. See, cycling downhill meant I wasn't exercising as much and the cold air was going straight into my damp gloves. Bad times. I had to stop at the bottom of the hill and had a funny five minutes where I had to get any extra layers I might have (small pac-a-mac and bonus Buff) and find some food for myself to eat. It almost felt like the cold in my hands had spread into my core and I could feel its icy fingers round my stomach. It taught me a valuable lesson in keeping local, especially if I'm out on my own in the cold. Since then I haven't really ventured outdoors on my bike, apart from to show a friend the way into town. So, how do I "fix" or solve this problem? I'm still not sure. I've bought some new shoe covers for my bike shoes (as well as new shoes, but that was a different problem of overuse!). I also wandered into an outdoor shop the other day (as you do when you have a random desire for Kendal Mint Cake...) and found some heat pads. I am going to try these out and see how I go. They even had ones that stick in your shoes. If they work, then I'm sorted. Perhaps I should find my hot water bottle for my feet when I'm working as well... now that's an idea!